I am writing to you today to thank you for the extensive damage that you have wrought on Ike’s face. You probably thought nothing of the consequences when you decided to bite poor Ike on the left side of his face. Ever since you did it, I have not been able to stop thinking about it. The bite seemed innocent enough at first. I dabbed it with anti-itch cream and headed home. By day two, Ike had multiple bumps on the entire left side of his face and the hair started falling out. By day four, most of the left side is now hairless and he has rubbed a few spots raw. None of the topicals we have applied have stopped the madness. I am now buying Zyrtec by the case (Ike needs 10 pills twice a day) in hopes of tempering the itching as the reaction subsides and heals. Please note that if I ever find you or your offspring, there will be immediate consequences felt. There will be no trial. I will be judge and jury rolled into one maniacal package. Punishment will be death by shoe/boot/brush/broom/any other inanimate object within striking distance. I will feel no remorse for my actions. I am not looking forward to the disapproving stares and snide comments by the DQs at this weekend’s show. I have started to work on Ike’s Phantom-of-the-Opera-style mask to hide the damage; I feel certain that the TD will accept it without question. I might add a cape for dramatic effect. The first person who asks, “Why did you let this happen?” will be pummeled with my piaffe whip. You have fair warning Mr. Spider. You’d better pack your bags and find a new home. Ike falls somewhere in the middle. Sadly, the big fellow can also be a bit of a klutz. (Ssshhh, I can hear some of you noting that he is just like his mother.) And while he may not exactly lie about how he injured himself, he is also not always forthcoming with how the injury occurred. I swear that he shrugs his shoulders when asked what happened to cause the loss of hair/blood/lameness/odd lump. Sometimes I can tell that the injury was inflicted by his brother. Other times I can locate the offending bug bite that started the itching and severe loss of mane. Last weekend I watched him misjudge how far away from the fence he was and bang his head on the fence post. I feared he’d hit his eye, but thankfully upon removal of the fly mask, he’d only scraped some hide off his face right above his eye. Most times though, I have no idea what caused the injury and all I can do is triage the damage and pray that we have some hair growth before the next dressage show. And the cause Ike’s lameness a few weeks ago will forever remain a mystery. We had a stellar lesson one day, a solid training ride the next, and emerged the next morning clearly limping. What the?! We had been working hard to strengthen our countercanter and develop a more powerful collected trot. I had been doing my best to teach him to reach more in his medium trot while trying to maintain my position in the saddle. He went from 100% sound to the walking wounded overnight. You could see him limping even at the walk and the problem was definitely the left front. No obvious signs of a problem; he only flinched when you touched the bulb of the hoof. My best guess is that he laid down to sleep and then whacked himself with one of the hinds as he flailed about to get up. There were no televisions nor any sweatpants to take the blame. We were lucky and after a week off from work, Ike came back completely sound. Amazingly he did not seem to lose any of his fitness or stamina from the down time. Wish I could say the same for me – a week out of the saddle always leaves me a bit rusty and slow to react with the necessary aids. We now work with polo wraps, pastern wraps, and bell boots to protect his legs and hooves. I’m still debating the merits of bubble wrap for turnout. Keep your fingers crossed that we make it through the second half of our show season! Phew, our last regular show weekend of the year is in the books – we just now have to power through to the championship show in October. This particular show is a special one to me since my dressage chapter is the one that hosts the show. We only have 45 members, so it takes everyone plus our supportive family members to pull off the weekend successfully. Planning starts pretty much the year before when dates are selected and judges are secured. 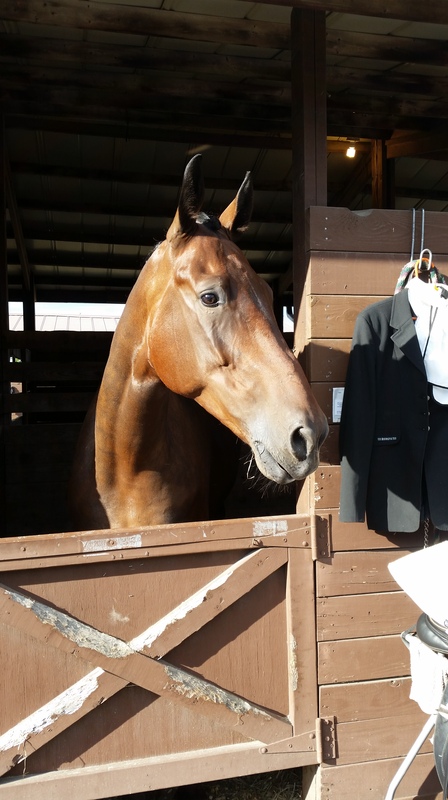 Since so many of us also like to compete at the show, there is careful planning so that everything is set so that we can still get our horses ready for the competition. Needless to say that the week leading up to the show is crazy as all the pieces and parts must be delivered to the show grounds and then assembled before the competitors arrive on Friday. And, if I can boast for just a second, I must say that we might be a small group, but we are mighty, and we pull off a mighty nice dressage show. We’ve got a tent full of vendors with fabulous wares to sell, delicious food, an air-conditioned and flushable port-a-john trailer (yes, you read that correctly, air-conditioned), lovely ribbons and prizes, generous sponsors, and the BEST volunteers. Mother Nature was a bit of a wicked witch on Saturday with some heavy rain, but the show went on and Sunday dawned a stunning fall day. There was a brief moment on Saturday morning that I questioned whether or not we would make it to the show. My husband and I arrived at the farm to hook up the trailer and load Ike. While my husband hitched the trailer, I was responsible for retrieving said horse and having him at the ready when the ramp went down. Ike revived his one man play of “The Gingerbread Man” and ran as fast as he could around his paddock avoiding Mom. Not even an apple would draw him close even when I shared the better part of it with his brother. Luckily Ms. C felt sorry for me and stepped in to help. Thank goodness that Ike never says “No” to her. When that happens, we are doomed. As I mentioned, Saturday was a bit of a soggy day. And when I say soggy, I mean soaked through to your underwear as you watch the rain stream off your very expensive saddle as you pray that there is no permanent damage. I must also get on my soap box for a moment and ask again who thought that WHITE pants were appropriate riding attire??!! Unflattering to most of us and rather transparent when wet. I’m fairly certain that the tag on my underwear was readable through the wet fabric. We ended up only riding our First Level test and with a personal licensed show best of 67.9% we came home with a pretty red ribbon. That test made me feel secure with where we are as we head to the championship show. Sunday dawned a better day. Crisp fall air and bright sunshine. Since we didn’t want a repeat of Saturday, Ms. C brought Ike in before we arrived. Sorry big boy. My first ride time was identical to Saturday and my second was shortly after – that meant we only had to tack up once which is always a good thing in my book. Anyway, our First Level test was not as tension free as Saturday’s ride, but we still managed a respectable 65.7% and another red ribbon. Would you like to take a guess at what caused our tension? Geese. Canadian geese waddling about right outside the fence line. Just what is it about birds that Ike cannot handle? At least they did not take flight since that would have guaranteed that I would have had a short duration flight as well. Our second test of the day was Second Level Test 1 or as I like to call it, the one with all the simple changes. Luckily, Ike and I have made progress in our simple changes and we actually received some 7’s for them during this test. Woohoo! There is hope for us yet. As you can see from the video, we still need to develop better throughness and Ike needs to sit on his hind end more, but considering that we really just started Second Level a few months ago, I am pleased with our progress. The plan is to work hard all winter and be ready to bust a move with Tests 2 and 3 at our first show in May 2016. We ended up with a 63.333% and a third place ribbon. Our goal for Second Level this season was not to make it to any of the championships, but to achieve at least 60% in our scores. I’m just thrilled to say that all of the Second Level tests that we have ridden this year have hit the 60th percentile range. With this show behind us, our sights are now set on the Region 1 GAIGs in mid-October. Big man is going to get a well deserved break for a few days and then we will be back to work to fine tune the elements for the First 3 test. Thanks for sticking with us this season!